So if you were able to get out to EC18 in Orlando this year, you would have seen all the news. If you didn’t get out there, then hopefully this post will capture all the information relating to video collaboration news. 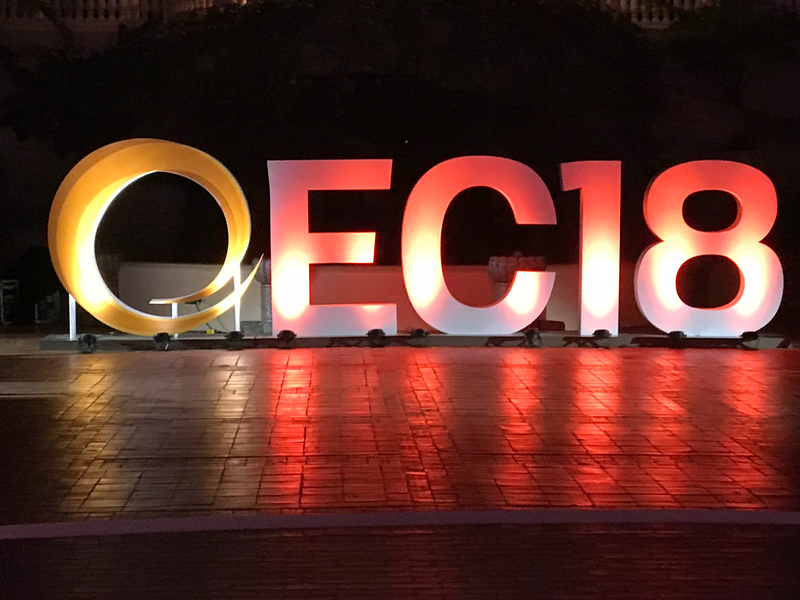 If you are looking for other news or highlights from EC18, check out Tom Arbuthnot’s blog here or Josh Blalock’s here. First up, Microsoft Teams won Best of Enterprise Connect this year. The product is just one year old!!! Inline message translation – exactly what it says!! This is a great feature for anyone. However, this isn’t new technology. Polycom has had this in it’s RealPresence Desktop software since version 3.8 as a tech preview. Neil Fluester did a demo here. However the new Teams implementation seems a lot tighter than the Polycom. 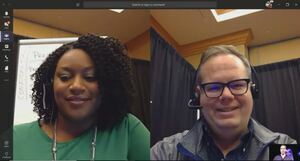 I did test the Polycom client with 3 different cameras (Facetime, Logitech Brio and Cisco PrecisionHD) and the results were the same as Neil’s, there is a large area around the face. I’m looking forward to testing it when it becomes available. See below for the before and after picture. So this is something that is similar to what is in Skype for Business today, your client can detect when you are in a meeting room. However, this is more intelligent (hey its not called intelligent communications for nothing) and you can join a Teams meeting from your laptop but it will first detect that you are near a certified Teams enabled room system and will just join as a presenter only. So this is a category I follow closely, purely because every customer that is going to use a Skype Room System v2 (SRSv2) or soon to be Teams, will ask at some point, how do I call my existing Cisco, LifeSize, Polycom, Tandberg system etc. So this is where Pexip can fill the gap. Anyway back to hardware. When Microsoft first announced this v2 (an evolution from the Lync Room System (LRS made by Polycom, Crestron and Smart) there was Polycom with their version, Crestron with theirs and newcomer Logitech with theirs. All were based on a Surface Pro 4 (now Pro 5) running Windows 10 Enterprise with the SRSv2 Windows Store app. This mean the device would boot up and log into the SRS app, so all three device manufacturers would have the same look and feel to the users, but they could choose their preferred hardware vendor. All were released at different times and all had pro’s and con’s. Fast forward nearly a year and Microsoft announced at Ignite 2017 that there would be two new entrants, Lenovo and HP. Lenovo had their SmartOffice ThinkSmart Hub 500 on display and this was very different. This was an All in One (AIO) that had it’s own screen and audio built in. This looked rather awesome. There were no details of the HP device at Ignite, however, I guessed right, they would be using their existing Slice platform for this. I’m actually going to do a comparison between all five devices and this can be found here. There was also a good video overview done by Matt Jordan at Logitech showing all the differences between the devices. I’ve been fortunate enough to receive one of these devices last week and I’ve connected it up with a Logitech Conference Cam. I personally love the form factor of an AIO. Less things to deploy and go wrong. Here is my unboxing of it and unwrapping here. 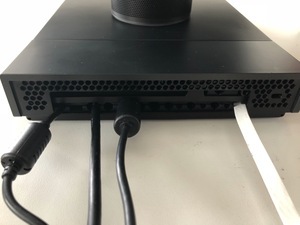 You can see the reverse of the Lenovo and the cables are clamped into place and then there is a flat head screw stopping people from just opening up and unplugging then. I have a full first time power on test and review video below. The Lenovo site is here and the Hub 500 retails at $1,799. It runs Windows 10 IoT with an Intel i5 7th Gen processor. This is shipping globally now. So this was the first time the HP was to be seen in public. It was highlighted in the keynote and was on display on the Microsoft booth. I’ve known about the Slice for a while as device but now it comes a certified device rather than just a Windows 10 device/room system. The HP site is here. Again, like the Lenovo, the HP Slice comes with the audio module and this is powered by Bang & Olufsen. It runs the same Windows 10 IoT as the Lenovo, have a status light too (which the Lenovo has as well) based on your presence of Skype. It has a neat rear cable connector for ease installation and to make the desk tidy. There is a separate screen/tablet that is running the SRSv2 software. The Slice G2 will start at $1,799, so the same price as the Lenovo. Don’t get confused with other Slice’s available. There is once that has Intel Unite package (no touch screen) for $1,299. Also other “Slice” modules are available to stack on top, such as a wireless charging module, obviously at extra cost. The Slice G2 is expected to ship in April 2018. 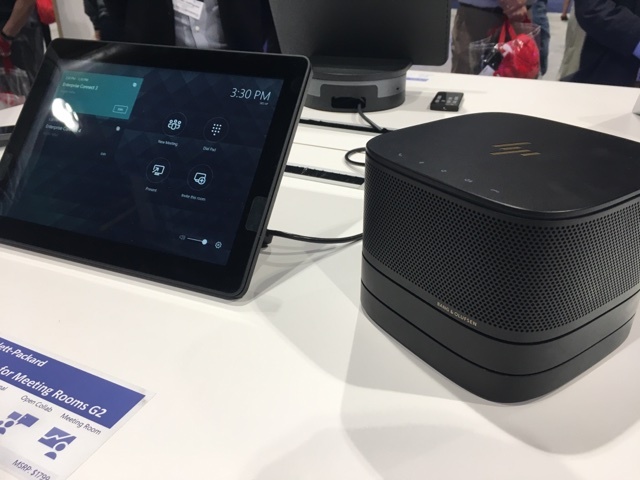 What’s new from the Logitech SmartDock is that they have a new base available, the SmartDock Flex, that can link into the existing base and then just bring out 1 Cat-6 cable from the table making it neat and tidy. Again this was previewed at Microsoft Ignite 2017. 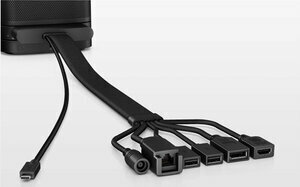 That was one of the issues I had with the SmartDock is that if someone moved it, then the cables could pop out. And because the base was screwed in with a hex screw, you had to have that screwdriver handy to plug it back in. 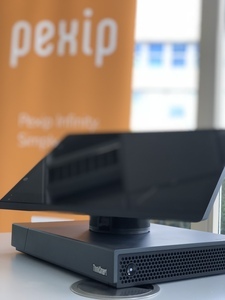 The other advantage of the new base, it can also provide AV pass through of the camera and mic to a connected laptop, which means the SmartDock can be used for other meetings such as Pexip, WebEx, Zoom, BlueJeans meetings. I’ve not seen this in action as yet, however, I wonder if it could cause confusion to users. 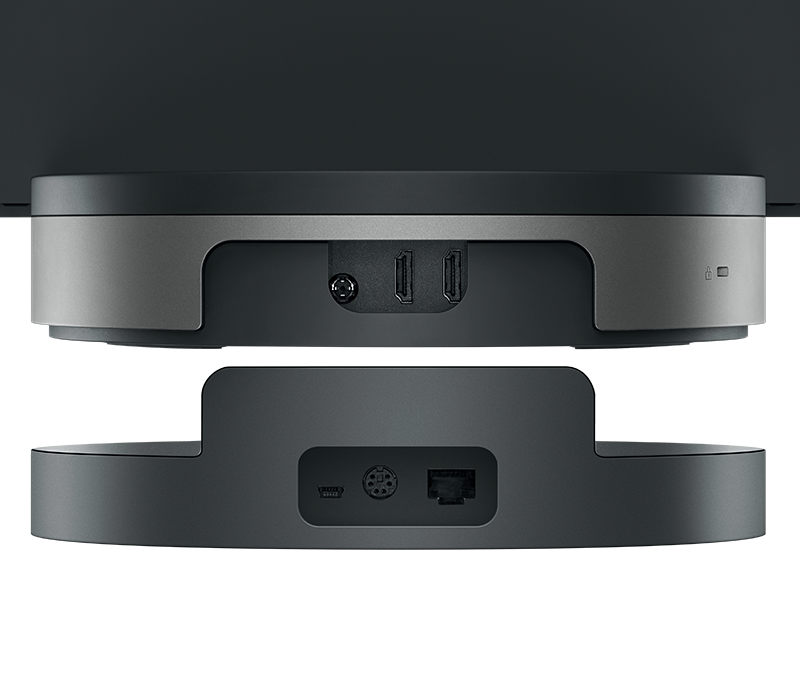 The SmartDock Flex will retail for $799. The Logitech MeetUp will get intelligent field of view, so will zoom out the camera when there are more people in the room, or zoom in when there are less. In addition, this will feed back the data to Teams to say that there were x number of people in a meeting room. None of this technology is new. Polycom were first with EagleEye Director and then Cisco released the SpeakerTrack. The counting of people in the room again, Polycom did that with the EagleEye Producer and then Cisco now has it in their Spark Room kits I believe. Anyway, the good thing with Logitech doing this, it is driving the cost down as you can have several MeetUps to one EagleEye Director/SpeakerTrack. So this is the new video interoperability for Microsoft Teams. Today, under Cloud Video Interop 1.0, you have the Polycom RealConnect for Office 365 and Pexip Infinity for Skype for Business Server. Both work on-premises and in Office 365. So when it comes to Microsoft Teams, think are slightly different. First off, all interop is designed so that everything joins the Teams meeting. Again, at Ignite 2017, it was announced that BlueJeans, Pexip and Polycom would be the only certified interop partners out there to provide 3rd party VTCs into a Teams meetings. Now there are two different offerings available. BlueJeans are building a new product, a gateway and will be a service, Polycom will be porting their existing RealConnect for O365 into Teams, having both services available. Where things get different, is that with Pexip, the end user will be responsible for running their video interop into Teams. This has some distinct advantages as users will be able to design and plan their own video networks and choose where to host even, so either in Azure, AWS or Google, or even on-premises, or a mash up of both depending where the interop is needed. As this was a tech preview of all three platforms at Enterprise Connect, there are no commercial costs available. There are however some video demos and images, see below. The BlueJeans shows just a video switched layout at present and there wasn’t an official video released. Zach Katsof at Arkadin recorded a UC Nugget which I’ve included below. Thanks to the official Bluejeans twitter feed for these two images. 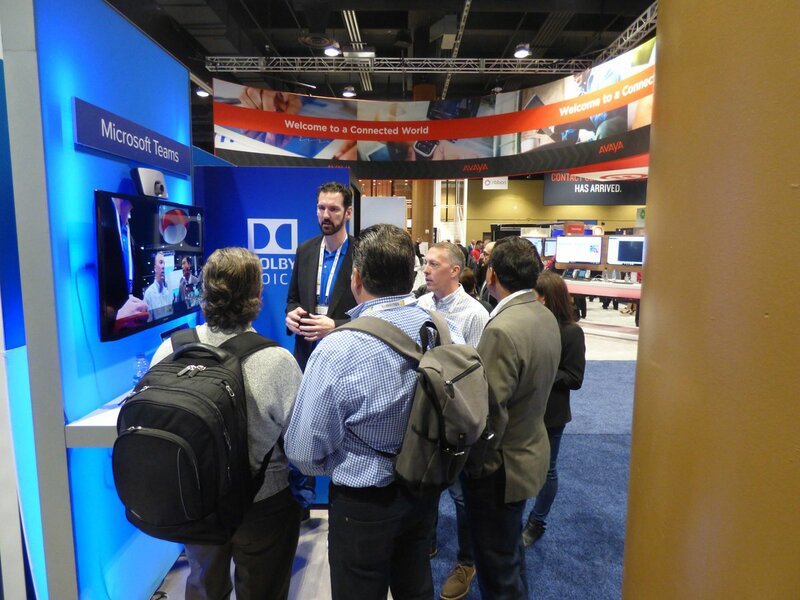 Adam Jacobs from Polycom showing off both the O365 and Teams interop services. Thanks to Adam for sharing the image on Twitter. So I’ve saved the best till last obviously!!! Pexip put some great effort into showcasing what they have done so far with Teams interop. It is the only one I’ve seen with content sharing too. 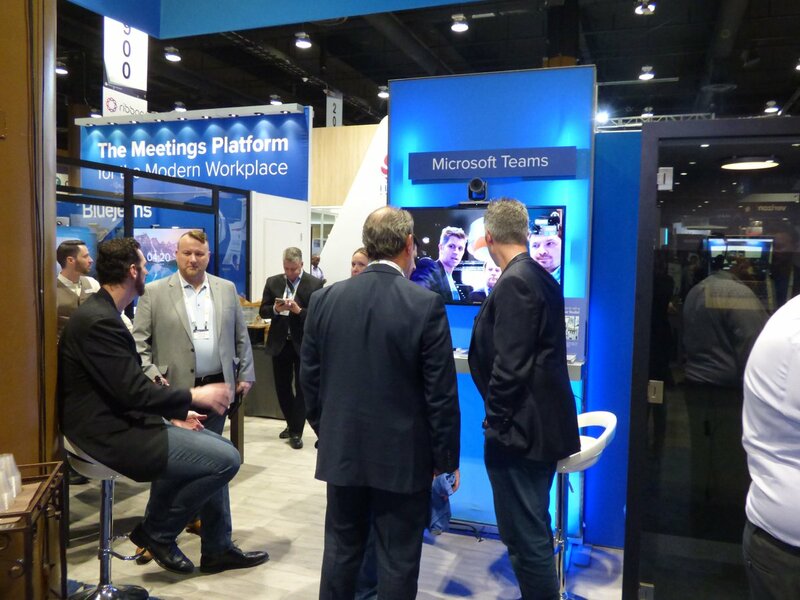 Below is the Pexip / Teams interop being shown on the Microsoft booth. I’ll also come up with a prize for anyone that can recognise the person in the top left in the Pexip New York City office!!! Here is a short overview from Zach at Arkadin and Jordan from Pexip. And here is a video that was recorded by Pexip showing the full workflow of the Teams interop being shown at Enterprise Connect. There were some other video related news from other vendors, but in reality it was meh!! Amazon announced new pricing for it’s Chime service, Starleaf revealed to the world that they are the first to deliver Teams Meeting Rooms support (no videos of this). 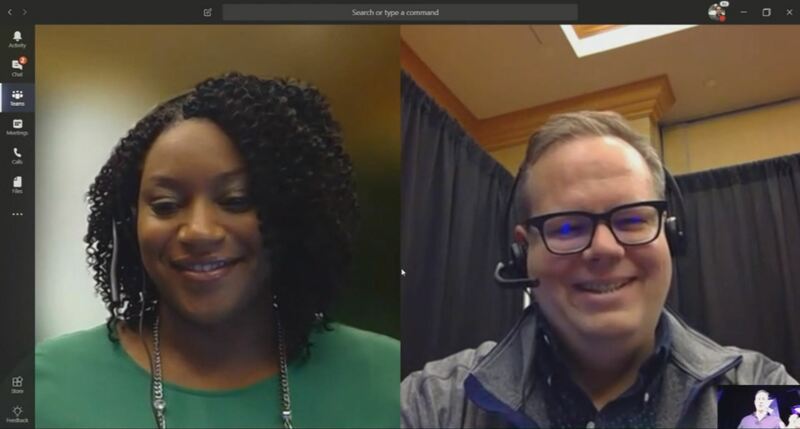 Cisco did a demo in their keynote of a Skype for Business call into a WebEx. Welcome to 2011!! That was nothing new. BlueJeans were also talking about their new clients and Dolby audio. Avaya launched some new hosted video stuff. Welcome back. Zoom created happiness by launching a new Dell AIO system Zoom Room. I’m actually writing this on my 4 year old Dell AIO. They also announced a new bundled Zoom Room with some hardware and integration with Alexa for Business and IBM Watson. Full review here. A point to note on this other news, all these products are not certified or qualified for Microsoft Skype for Business or Microsoft Teams if that is your chosen platform. Feel free to leave any comments below or anything you think I’ve missed.